No other cryptocurrency portfolio manager is packed with as much functionality as CoinTracking.info. Nothing comes close to the convenience and value that it offers either. It has everything you’d want from a portfolio tracker, plus much more. Even after testing numerous alternatives to CoinTracking, I haven’t been able to find any cryptocurrency portfolio manager which has as much functionality for the same cost. In this review, I’ll walk you through some of its best features and why it’s the #1 cryptocurrency portfolio manager available. Browser-based, but has a mobile app too. Automatically tracks your transactions on over 37 cryptocurrency exchanges. Generate reports of your cryptocurrency trading or investment performance. e.g., ‘realised and unrealised gains’ and ‘average purchase prices’. Generates tax reports using 12 different methods (FIFO, LIFO, HIFO, LOFO, HRMC, and more). An ‘easy enter’ feature which is free and allows you to watch your portfolio in an easy, simplified interface. These are just some of CoinTracking’s features. You can find an overview of features on their homepage or here. DEMO: I’ll walkthrough some of the main benefits of using CoinTracking below. If you’d prefer to explore its benefits yourself, you can play around with their demo account (which has sample transactions). At the time of writing, CoinTracking allows you to automatically import transactions from 38 exchanges. This includes popular exchanges such as Binance, Bittrex, GDAX, and Kraken. Setting this up is quick and easy. You just need to allow CoinTracking read-only (so it can’t withdraw or make trades) API access to an exchange. CoinTracking provides step-by-step instructions to help you out for each exchange. Once you’ve set this up, you’ll never have to manually enter transactions you make on that exchange again. This is super-convenient and has saved me heaps of time since I started using it. By itself, this makes CoinTracking worth the money for me. You can also setup CoinTracking to watch your cryptocurrency wallets for incoming and outgoing transactions. You can set this up for BTC, ETH, and over 200 other altcoins. Yet another awesome feature. For those exchanges which you can’t automatically import transactions from (e.g., LocalBitcoins), you can manually import your transactions. You’ll do this by downloading a CSV file from the exchange and then uploading it on CoinTracking. They provide instructions to walk you through this. If you use an exchange which isn’t on this list, you can still import CSV or Excel files. If you’re doing this, I’d suggest you upload these transactions through the Excel import. They provide some instructions here. You probably won’t need this, but it’s nice to have. 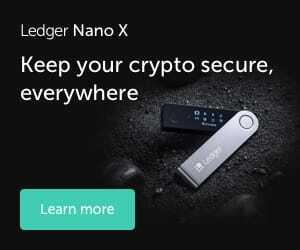 You can also manually import incoming and outgoing wallet transactions from Blockchain, Electrum, Exodus, Mycelium, and Trezor. As before, this process is quick and easy. The real benefit of using CoinTracking is the wealth of information which you can glean from their dashboard and reports. Because all your transactions are tracked in one place, you’re able to make better, more informed decisions about whether to buy/sell something (or do nothing). It’s helped me a lot. These reports might be intimidating at first, but there is website documentation and an FAQ on some pages (see screenshot below). This can be found at the top right on some pages. A realised gain (or loss) is the profit (or loss) you’ve already generated with purchases/sales. Some more details here. This shows the current unrealised and realised gains (or losses) for all the cryptocurrencies you currently hold. By default unrealised and realised gains are calculated using the FIFO (first-in, first-out) method, but you can change this. I’ve found this extremely useful for monitoring the value of my realised gains and keeping track of my (approximate) capital gains obligations. In comparison to the information shown on the unrealised and realised gains page, only the average purchase price is calculated here. In December 2017, I was using this to average down the purchase price of some cryptocurrencies I held (so that I wasn’t exposing myself to as much risk). For some cryptocurrencies, I just wanted to play with the profit I’d made – not any of my initial investment. In such cases, I would pull out the value shown in column 2 (see below) from my cryptocurrency holdings. For example, I’d withdraw about £1000 worth of DOGE to put my purchase value below £0. All my remaining DOGE would be profit. Even if DOGE price falls to £0.00, I wouldn’t have lost any of my initial investment. If you upgrade to one of CoinTracking’s paid plans, you’ll get access to their do-it-yourself tax report generator. You can customise all the details of the report for your country of residence. There’s guidance for the USA, Germany, Netherlands, Australia, Austria, and Canada. As of February 2019, CoinTracking.info also support tax reports compliant with HRMC guidelines. Check out the /r/BitcoinUK tax thread. Ask questions in the /r/BitcoinUK discord. If you’re liable to pay tax and unsure whether your report is correct, it’d be sensible to get professional help. Getting on the wrong side of the taxman doesn’t sound like a good time. How do I setup alerts up? 1. Go to the 1st page (the app dashboard) and tap on a cryptocurrency. 2. In the bottom right, tap the bell which says: ‘Alerts OFF’. 3. Tap the ‘+’ symbol in the top right. 4. You can now setup alerts for when the price hits a specific fiat (e.g., GBP) or BTC value. 5. Tap ‘Save’ and you’ll see something like this. 6. You can add multiple alerts for when the same cryptocurrency hits other price points (just repeat the process). Once an alert is triggered, it’ll push a notification to your phone. It then turns OFF that alert. You must repeat this process for every cryptocurrency you want to setup an alert for. Tapping your ‘Back’ button while on any page. Check the amount of cryptocurrency you hold, their overall value, and their value per unit. Add entries (entries for the same coin are aggregated on page reload). 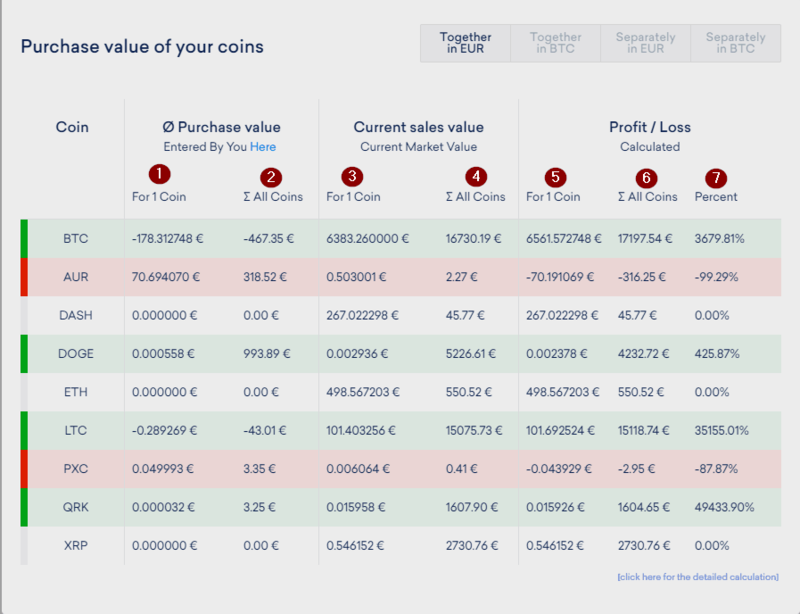 Check out the profit/loss for each cryptocurrency you hold. I’m not a fan of this. You’d be better served using Blockfolio, Delta, or AltPocket if this is all you want. I don’t think this is worth using. 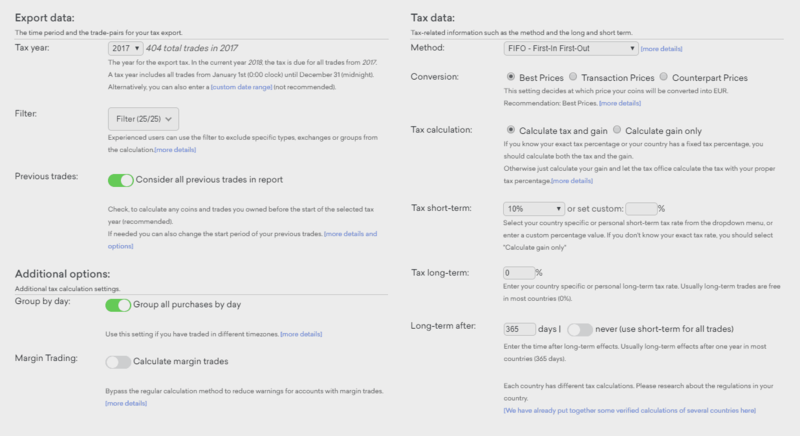 You can try out CoinTracking with a free account (manage up to 200 trades), but you’ll need to upgrade your account to unlock all its great features. A 10% discount (on any account upgrade) when you signup through this link. A 5% discount when you pay with BTC. Although priced in BTC, upgrades are anchored to the fixed cost shown below. Compared to leading alternatives like Delta.io (£64/year) and AltPocket (£120/year), this is incredible value. What CoinTracking offers is miles ahead. The cost for a lifetime unlimited license does seem a little crazy (at £1432) though. You’d be wiser to just stick with the two-year plan and then re-evaluate your options when it comes time to renew. I’m a big fan of CoinTracking. Before settling with CoinTracking, I tried several well-recommended mobile and desktop cryptocurrency portfolio managers. But nothing comes close to the convenience, functionality, and value of CoinTracking. I still think it’s the #1 cryptocurrency portfolio tracker out there. But I wouldn’t recommend this for everyone. If you’re making less than 50-100 trades a year, I don’t think it makes much sense to buy a license for this. Stick with a spreadsheet or free options (e.g., Delta or Blockfolio). But if you are making regular trades, then I think CoinTracking is a must-buy. It saves you time, works straight out of the box, and helps you make better decisions. For less than £60 a year, I think it’s a great deal. REMINDER: You can test-drive most the features by signing up for a free account. Sign up through this link and you’ll get 10% off if you decide to upgrade later.